The former National Security Adviser is on a 19-count charge bordering on money laundering and criminal breach of trust to the tune of N13bn. Mr. Dasuki allegedly distributed billions of naira meant for arms purchase for the fight against the insurgent Boko Haram group, to politicians, his cronies and family members. Metuh is the spokesman of the Peoples Democratic Party (PDP), Metuh is charged with breach of public trust, corrupt acquisition of public funds and money laundering. EFCC accused Metuh of receiving the N400m from “an unlawful activity” of the immediate past National Security Adviser (NSA), Mohammed Sambo Dasuki. A Federal High Court in Abuja ordered the remand of a former Acting Governor of Adamawa State, Umaru Fintiri, in Kuje prison, Abuja, over five counts of money laundering charges involving about N1.9bn preferred against him by the Economic and Financial Crimes Commission. Air Marshal Amosu (rtd) is the immediate past Chief of Air Staff. He is embroiled in the ongoing probe of the $2.1 billion arms procurement fund. Amosu is accused of engaging in acts that were not only “misleading and unpatriotic” but of shortchanging the country in procurement deals for attack helicopters and other equipment for the Nigerian Air Force. A Federal High Court ordered the remand of a former Minister of Aviation, Femi Fani-Kayode over an alleged fraud of N4.6bn. Fani-Kayode, who was the spokesperson for former President Goodluck Jonathan’s campaign organisation in the 2015 general election, was accused of conspiring with the others to directly and indirectly retain various sums which the EFCC claimed they ought to have reasonably known were proceeds of them. A Federal High Court judge in Abuja sent former Nigerian Chief of Defense Staff, Air Marshal Alex Badeh (rtd) to Kuje prison. Mr. Badeh was arraigned in court for corruptly enriching himself with Nigerian Airforce defense funds to the tune of N4 billion. Operatives of the Economic and Financial Crimes Commission (EFCC) claimed they found over 1 million dollars in hidden safes during a search at the home of the former air force general. Abba Moro is the former Minister of Interior. Moro is currently facing trial over their alleged complicity in a N676 million job recruitment scam. He is answering to an 11-count charge preferred against them by the Economic and Financial Crimes Commission, EFCC. The Deputy National Chairman of the PDP allegedly received 25 exotic cars worth over N300million which the embattled promoter of Atlantic Energy Concepts Limited, Jide Omokore, allegedly bought for top officials of the Peoples Democratic Party. Prince Secondus received the cars for onward distribution to other beneficiaries. 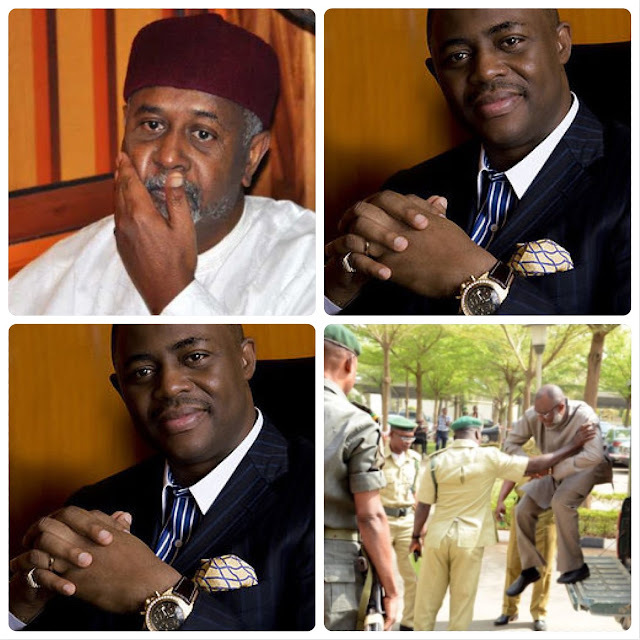 Secondus was arrested in his Abuja home. The AIT Boss, alongside his company, DAAR Investment and Holdings was arraigned to the six-count charge bordering on alleged procurement fraud and breach of public trust preferred against him by the Economic and Financial Crimes Commission, EFCC. The Economic and Financial Crimes Commission recently arrested Jafaru, who is a former military governor of Kaduna State and chieftain of the ruling All Progressives Congress. Jafaru is President Mohammadu Buhari's political associate. The retired soldier is believed to have been arrested for receiving over 100 million from National Security Adviser (NSA), Sambo Dasuki. Air Vice Marshal Olutayo Oguntoyinbo was remanded in Kuje prison following his arraignment before a High Court of the Federal Capital Territory. Oguntoyinbo, who is a former chief of training and operations of the air force, was accused of receiving the bribe from a contractor with the NAF, Société D’ Equipments Internationaux Nigeria Limited, using a company, Spaceweb Integrated Services Limited.